I have a noisy sparse signal containing number of frequency components. Is there any method to uniformly denoise this signal. in other words, a method that estimated and eliminates the noise power across all the frequencies in the band and not only on the borders like in wavelet denoising? The following plot is an example of what I was saying. I have 3 peaks and want to cancel the noise below these peaks. It appears you have some observed signal, $Y[n]$, which is some sort of mixture, and we take $Y[n]$ and create a Hankel matrix from it using some desired frame length M (this will effectively determine your sub-space resolution...more on that later). Now that we have our Hankel matrix, we can either compute $R_Y$ directly and then do an eigendecomposition, or we could go with a Singular Value Decomposition of the trajectory matrix. You'll find them to essentially be equivalent if we use the left singular vectors; either method is perfectly valid. Now that we're here, we can use the singular values to determine amplitude of the signals themselves, and the principal components essentially determine the "parts" of the signal, i.e. $X[n]$ and $\epsilon[n]$. This new matrix, C, is what we call the reconstructive component(s) of $Y$. We're not quite done yet, because $C$ is the same dimension as our Hankel matrix, $Y$, so do get back to our signal, we'll need an additional step. To reconstruct the series itself, we'll perform what's called diagonal averaging. The goal here is that we'll finally map back to a single signal, let's call it $Y_out[n]$. It's in this step that we'll be able to utilize that one-to-one relationship of the Hankel to the series to extract out signals. This step is a bit long winded, so I've omitted it for brevity, but you can consult Wikipedia or any of the many papers/texts on SSA for more information. So that's SSA in a nut-shell, and naturally there is a lot you can do with the method. 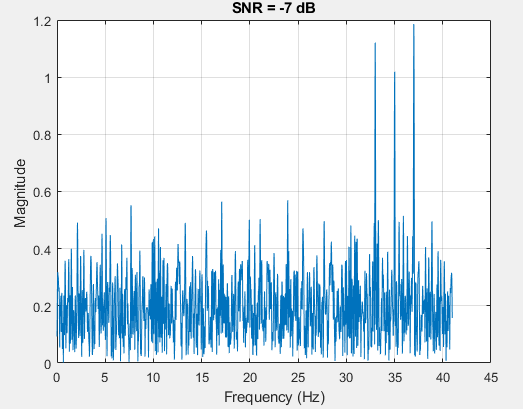 So long as you have some appreciable signal to noise ratio (SNR) in the frequency domain, I think you'll find SSA works quite well for extracting out frequency-separable signals. The big issue is obviously going to be determining which principal components you care about. So, in short, if you have some time series observation, you can use SSA to attempt to discern individual signals/trends. It's a really powerful tool, and as long as the signals are separable, you should have some reasonable success. Now if you have several observations of the same data (let's say you had several sensors observing the same singals), you could attempt to use some classic blind source separation techniques, such as principal components analysis (PCA), independent components analysis (ICA), etc. Your question didn't seem to indicate such, but if that's the case let me know and I can include some details on those methods as well. Hope that helps! Not the answer you're looking for? Browse other questions tagged matlab signal-analysis gaussian denoising sparsity or ask your own question. Poisson noise and curve fitting - denoise first? How to preprocess such signals?